[title] => Sell old jewelry for cash or redesign it for fun! All of us, some time or another, have inherited or received vintage jewelry. The question is, what are some of the options we can do with it? From selling jewelry to redesigning, there are a couple of answers that will raise your appreciation for acquiring vintage and antique jewelry.One of the options you have when dealing with old jewelry is selling it. If you feel that you have no use for whatever jewelry you have or just need some quick cash, we here at Global Gold and Silver will be more than happy to pay you cash for your unwanted gold and silver jewelry. You can find more information about selling your unwanted jewelry from our previous blog posts. Another option you have is to redesign your outdated jewelry. Taking apart a vintage bracelet and reconstructing it back together can be fun and creative. Adding or subtracting different components to a piece can turn an old-fashioned necklace into a chic and stylish statement. Even changing up small details like switching from chain to a colored cord can add a pop of color to any new piece of jewelry. One more helpful tip is turning one piece of jewelry into another! Say for instance you inherited a necklace with precious gems in it but hate the design. At Global Gold and Silver, we are able to sit down with you and discuss your options on how you can turn this piece of jewelry into something you would wear. Those gems can be easily taken apart from that necklace and turned into a beautiful set of redesigned custom earrings! If you we're thinking of selling gold be sure to bring a drivers license or other government issued identification with you! Recently a potential customer walked in and we made and offer to buy, although his license became an issue upon inspection and sadly - he was turned away! 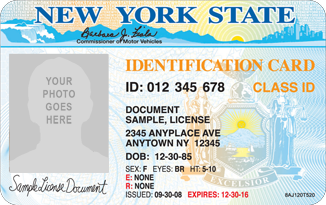 Why do gold buyers require a valid ID? The first reason gold buyers require ID is the federally mandated Patriot Act, enacted after September 11th. One provision requires every gold buyer to implement an "Anti Money Laundering Policy" in order to prevent and report suspicious activity. Additional regulations are mandated by NYC Department of consumer affairs ( or your local jurisdiction ), these rules are in place to prevent NYC gold buyers from purchasing stolen merchandise from less than honest gold sellers. so before you run out of the house with a fistful of gold ready to cash out, remember to bring ID. We know you have many options to sell gold in NYC but avoiding shady gold buyers is key to a profitable payout. We want you to sell gold with confidence and have a few tips to help you do just that! Start with trust, selling your gold to a BBB accredited business will ensure that you are dealing with a gold buyer that cares about his business reputation and can be held accountable! Most NYC and NJ gold buyer have a BBB logo posted on their website but what if they just put it there to mislead you? No one would do that, right.... Well after watching our competitors do it for years it's time you the consumer could know the truth! Simply click on the logo and you should be taken to the BBB website WITH the gold buyer’s accreditation seal and info. Check the price of gold before visiting a NYC or NJ Gold Buyer. The price changes daily but it's a click away, visit kitco.com for current precious metal prices. The price shown is for 24 karat pure gold; however most American scrap gold is only 14 karat pure so that's about 58% of the full price. Remember that any gold buyer will also need to make a profit so be realistic in your expectations. There are many cash for gold stores and jewelry stores in the NYC and NJ area that buy and sell gold. In fact most jewelry stores have been around much longer and can offer better service than a new neighborhood cash for gold store that has no true experience with jewelry! By shopping around you will be able to sell your gold with confidence for the highest price. Never compare prices over the phone, especially if your selling gold in New Jersey or New York area. The most unethical gold buyers will quote you unrealistic prices over the phone and take their chances when you come in. Often times this is the biggest mistake gold sellers make when choosing a place to sell gold. Good trustworthy service is worth more than false promises over the phone. Find a gold buyer with experience to properly evaluate your jewelry upon inspection - not a 1 minute phone call. Ok, sometimes you have no idea and that's fine if you just shop around. However, a gold jewelry bracelet with XoXoXo is going to be melted while Tiffany & Co estate jewelry is worth much more than its weight in gold. Look at your gold jewelry for diamonds, gemstones and famous brands or collectability. if your not ready to part with your jewelry just yet it's ok, there's no rush. Gold prices are high and chances are it will stay that way. it won't be fun if you sell something and regret it later . Sometimes it's a good idea to restyle certain gold jewelry items instead of selling gold at the wrong time. You can also get more value sometimes by re-gifting small items that are not worth much in gold but make beautiful jewelry for someone else to enjoy! Thanks for reading and be sure to keep us in mind when your ready to sell gold in NYC, NJ or through the mail. Learn more about selling gold with Global Gold and Silver. Buyers should be willing to give you a company check, or at least go through a reputable source, such as PayPal. Be wary of any buyer who wants your bank account information. Giving out your private bank account information is a good way to have your personal information compromised, and it should be avoided. Parting with sentimental items can be difficult sometimes, and a good buyer shouldn’t pressure you into selling just to make money. Good buyers will understand that it can be a difficult process to part with your valuables and won’t pressure you into making an immediate decision. If you need to walk away from a deal because of high pressure sales tactics, walk away. Weighing your gold is what determines how much you’ll make from selling your valuables. This should always be done  by gold content. 10k gold should be weighed with 10k gold, 24k with 24k. Don’t mix metals, or you’ll end up with a less than desirable payout. Additionally, your gold should always be weighed in front of you. If your potential buyer wants to take your items to the back room to weigh them and won’t allow you to come along, don’t fall for it. Selling your gold shouldn’t be a difficult process. As long as buyers are respectful, don’t pressure you, weigh your items in front of you, and don’t ask for your personal bank account information, you should feel good about making the sale. As always, don’t be afraid to get a second opinion. Shopping around can help you see how much your items are really worth! Don’t fall for the scams that are out there. Make sure you’re dealing with an honest buyer when you sell your gold or silver. New York City – January 16, 2013 – Global Gold and Silver, a leading New York-based company offering cash for gold services, is pleased to announce their simple, hassle-free process for selling gold jewelry, silver, gold coins, and other pieces – all backed by a 100% satisfaction guarantee. A few of the ways Global Gold and Silver ensures their customers always receive a fair and honest offer by testing all items in front of the customer; and providing private one-on-one service. If you try to sell your gold and the gold buyer tells you they have to take your items to the back to test them, don’t believe it. Each gold item should be tested for purity right in front of you, sorted according to its gold content, and it should be weighed on a scale in front of you. Global Gold and Silver does just this, telling you exactly what price you’re getting per troy ounce or per gram of gold. When selling your gold, coins, and jewelry you should always expect private and one-on-one service. In addition, every legitimate gold buyer is required by law to request a government issued ID from the seller. If this doesn’t happen, that should be a red flag for you. Global Gold and Silver treats its customers with the utmost respect and professionalism, and will always provide you with a written receipt after buying your gold. Global Gold and Silver is one of the only “cash for gold” companies that employs a Certified Diamond Gemologist as well as an experienced staff with real knowledge about high end watches, gold and silver coins and estate jewelry. They recognize that there are many items worth more than their weight in gold and silver, and their buyers have the tools and experience needed to appraise items according to their history and collectability for proper fair market value. For more information on Global Gold and Silver’s services or to view the recent purchases gallery, visit www.globalgoldandsilver.com. This coin is 10 ounces of pure 24 karat gold that commemorates the wedding of Prince Charles and Lady Diana Spencer. On July 29, 1981, Lady Diana Spencer became Diana, Princess of Wales. The beloved Princess and her marriage to the Prince are commemorated on this spectacular gold coin. 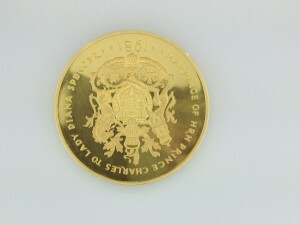 The year of the wedding is printed on the front of the coin, along with the royal crest and the words “Marriage of HRH Prince Charles to Lady Diana Spencer”. Having this piece of history is remarkable, and is sure to be a treasured part of a collection for generations to come. Sapphires from Kashmir are known to be among the best. With a spectacular cornflower blue color and a sleepy quality, these gems are some of the rarest in the world. The stones are known for the velvety blue color they exhibit naturally. Discovery of new sapphires that matched the quality of the earliest and most astounding discoveries slowed greatly in 1887, so most of the sapphires that were to be found are already owned across the world. 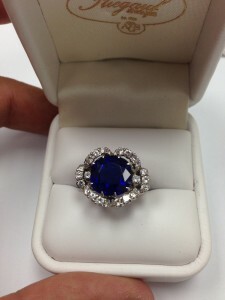 With the exception of private sellers and estate sales, buying a Kashmir sapphire is almost impossible. Global Gold and Silver is proud to have acquired these fine pieces, making them the hottest purchases of 2012. We look forward to what 2013 has in store for Global Gold and Silver! Sell old jewelry for cash or redesign it for fun! All of us, some time or another, have inherited or received vintage jewelry. The question is, what are some of the options we can do with it? From selling jewelry to redesigning, there are a couple of answers that will raise your appreciation for acquiring vintage and antique jewelry. If you we're thinking of selling gold be sure to bring a drivers license or other government issued identification with you! Recently a potential customer walked in and we made and offer to buy, although his license became an issue upon inspection and sadly - he was turned away! We know you have many options to sell gold in NYC but avoiding shady gold buyers is key to a profitable payout. We want you to sell gold with confidence and have a few tips to help you do just that! Start with trust, selling your gold to a BBB accredited business will ensure that you are dealing with a gold buyer that cares about his business reputation and can be held accountable!